Amarion Pena, left, and Christian Reynolds work together on Chromebooks during Kesha James' sixth grade class at Dr. Louis A. Cerulli School No. 34 in Rochester, New York on Tuesday, February 23, 2016. The district is in the early stages of a planned 1:1 device to student program. Emma Timbers studies on the historic quad at Bates College on October 23, 2012. Olivier Brillant laughs as Associate Professor of Mathematics Pallavi Jayawant (right) speaks to a class of Summer Scholars at Bates College on July 25, 2013. Confetti flies at the University of Rochester's Commencement Ceremony on Sunday, May 18, 2014. Science teacher Corey Skinner helps Fatima Ahmad, left, and Urmila Biswa during class at Rochester International Academy in Rochester, New York on Tuesday, February 23, 2016. The district is in the early stages of a planned 1:1 device to student program. Students work in Ladd Library at Bates College on October 11, 2012. 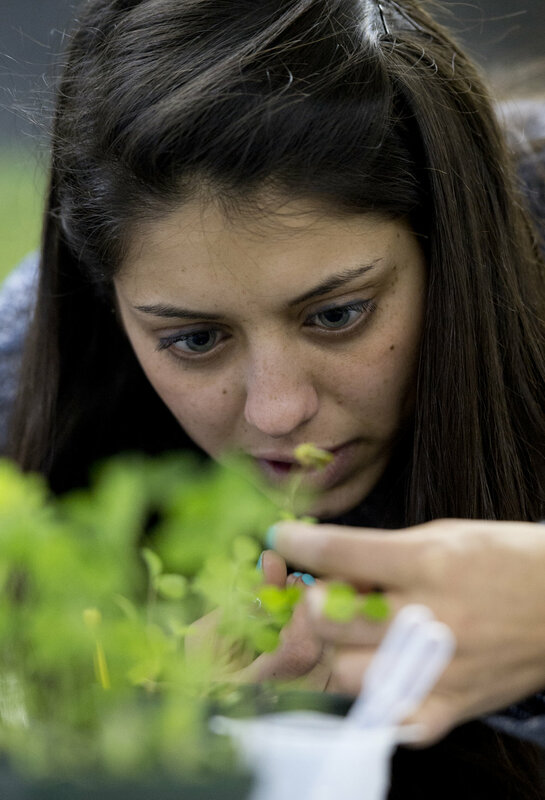 Tara Patel analyzes a plant sample during a lab session of Ecology and Evolution at Bates College with Professor Will Ambrose on February 11, 2013. Students at Colgate Rochester Crozer Divinity School in Rochester on Wednesday, April 29, 2015. Nasir Williams, left, and Reyshaun Okafor read during Kesha James' class at Dr. Louis A. Cerulli School No. 34 in Rochester, New York on Tuesday, February 23, 2016. The district is in the early stages of a planned 1:1 device to student program. A MacBook Air cart at Lakeview Elementary School in Solon, Iowa on Tuesday, March 8, 2016. Rupa Thapa, top left, and Suk Rai, top right, work on Chromebooks during a science class at Rochester International Academy in Rochester, New York on Tuesday, February 23, 2016. The district is in the early stages of a planned 1:1 device to student program.